Want to try something hard? How about product photography? Yes, product photography is hard. You might not think so until you’ve tried it yourself. I dabble in it once in a while, but I don’t do it on a routine basis. I wanted to show you my new BH-40 ballhead from Really Right Stuff. I’ll talk it about it a bit more in the near future when I’ll do a post on tripods (the short answer: I love it). However, here I’ll rather explain a bit how I took this picture. Some of the challenges in product photography include background, lighting, the need for attention to detail, and depth of field, especially for small products. Unless you show a product in context (say a car on a road), you usually want the background to be neutral, e.g. completely white. Lighting should be even (no dark or harsh shadows), and at the same time a few highlights can give that extra shiny or sparkly look. You can buy a fancy kit (something like this or this), or you can improvise like I show below. Attention to detail is important. Are you showing all the features of the product (e.g., all the knobs and handles in this case)? Is the object really clean and free of scratches? You wouldn’t believe how much a tiny speck of dust will show on a macro of a small product. Of course you can retouch it to some extent, but the cleaner you start, you less work you’ll have in post-processing. Another challenge is depth of field. It depends on the product, but you often want the whole thing in sharp focus. If the product is small, and you’re using a macro lens or otherwise shoot it at a really small distance, getting enough depth of field can be quite hard. See what you get with f/16 for starters. 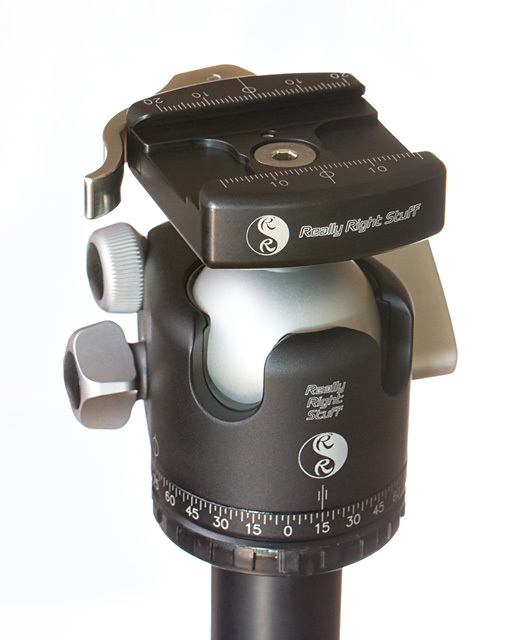 With even smaller apertures (larger f-stop numbers like f/22) you tend to lose sharpness due to diffraction. If you’re not getting enough depth of field, you’d have to stack multiple photos where the focus was set to different distances. 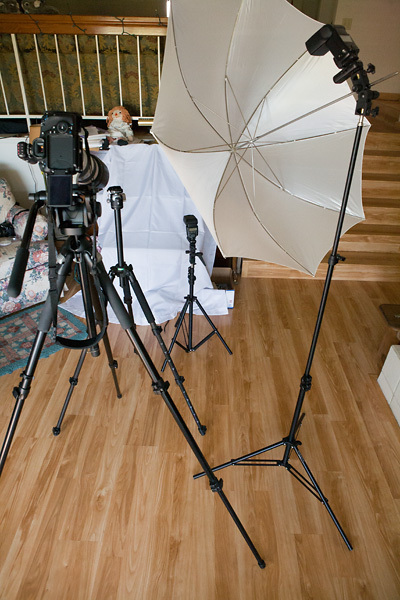 From left to right: camera on tripod, the ballhead on another tripod, a white background cloth (draped over a piano bench), a wirelessly triggered flash on a light stand to light up the background, and another wirelessly triggered flash shooting through an umbrella for a main light. There was also some light coming in through a large window behind me, and the final exposure was a mix of natural window light and flash light. The main light actually ended up on the other side (to our left rather than the right), but this was the cleaner shot of the setup with far less unrelated clutter showing. This entry was posted in Photographic Equipment, Picture of the Week and tagged ballhead, photographic equipment, photography, product photography, really right stuff. Bookmark the permalink. Nice shot that easily matches or even surpasses the photographic quality of the company’s own advertising. For some reason, your shot conveys reliability and solidity to me. Thanks.